The race started off well for Hamilton, leading on the run up to Turn 1, with Jenson Button and a Toro Rosso running wide out of the first corner. Daniel Ricciardo slotted into second while Hamilton's teammate and closest championship rival Nico Rosberg fell back to third. Valtteri Bottas suffered a puncture and had to pit after the first lap. Nico Hülkenberg retired on lap 7 due to earlier collision damage. On the corner before the backstraight DRS zone, Esteban Gutiérrez of the Haas F1 Team locked up the front right tyre heavily and retired subsequently due to brake problems. On lap 31, Max Verstappen retired due to a gearbox problem and stopped out of the first DRS zone, triggering a Virtual Safety Car period. Kimi Räikkönen retired after coming out of the pit lane during a routine stop with a loose wheel. Hamilton went on to win his 5th race in the United States, with Nico Rosberg in second and Daniel Ricciardo rounding out the podium spots. Hamilton reduced Rosberg's lead in the Drivers' Championship to 26 points with 3 races left in the season. 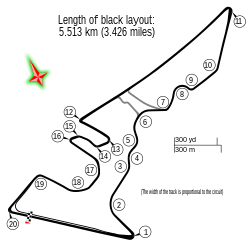 ^1 – Kevin Magnussen received a five-second penalty after the race for an illegal overtake on Daniil Kvyat. ^ "United States". formula1.com. Retrieved 3 October 2016. ^ "Weather information for the "2016 United States Grand Prix"". The Old Farmers' Almanac. Retrieved 31 August 2018. ^ "2016 Formula 1 United States Grand Prix – Qualifying". Formula1.com. Formula One World Championship Limited. 22 October 2016. Archived from the original on 23 October 2016. Retrieved 23 October 2016. ^ "2016 United States Grand Prix Race – Provisional Classification". FIA.com. Fédération Internationale de l'Automobile. 23 October 2016. Archived from the original on 23 October 2016. ^ a b "United States 2016 - Championship • STATS F1". www.statsf1.com. Retrieved 21 March 2019. Wikimedia Commons has media related to 2016 United States Grand Prix.